But sealing the silverware thanks to a slip from old enemies United and their boss Jose Mourinho — a long-time rival of Guardiola — was a sweet moment, especially after they lost to their neighbours in the Manchester derby last weekend. With 28 league victories so far, City need three more wins to top Chelsea’s record of 30 Premier League wins in a season. 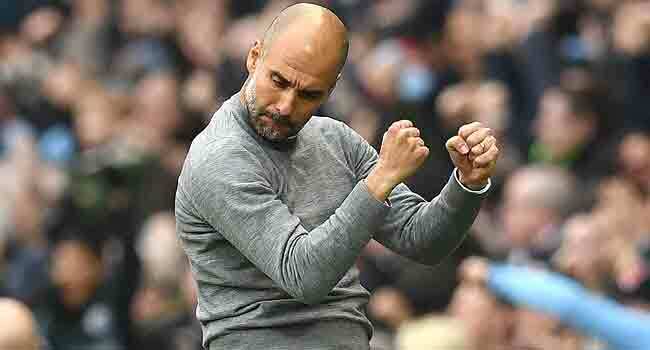 City have won 14 games on the road this season and have two to go away from home — winning both of those would beat Chelsea’s record of 15. City’s title is the 24th trophy of his glittering career. Speaking after Saturday’s 3-1 win over Tottenham, the 47-year-old gave all the credit to his players. “I am so glad to be here and be part of this club. These guys are fantastic, awesome, they are incredible,” he said.